Pierre and Oliver were looking for another fort to appear, but sadly I had to work. Meanwhile, the inside kitties get forts everyday on the couch. 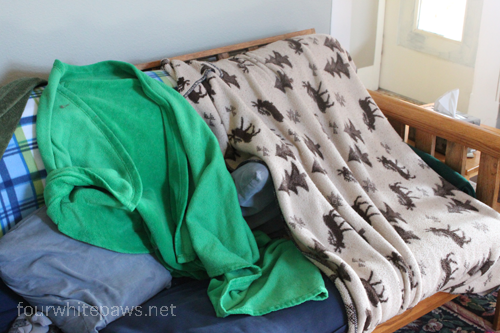 They are simple to make, just tuck one end of the blanket behind the top cushion and the other end on the bottom side - instant kitty fort! Demand for the forts can be high, so I always try to have at least two available. Build your kitty a fort today! Happy Friday!! 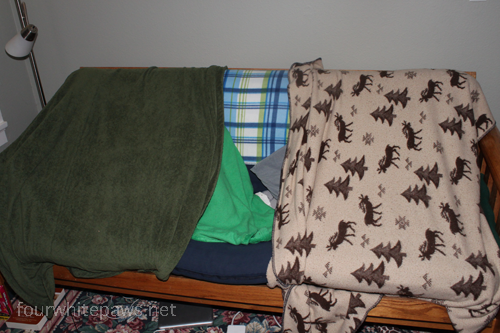 We make forts by draping coats or shirts over single chairs, for single occupancy. Actually, only Chuck will inhabit a fort...Angel prefers to sleep in clean air, just in case something wants to swoop down and eat her. Oh your kitties always have such fun! 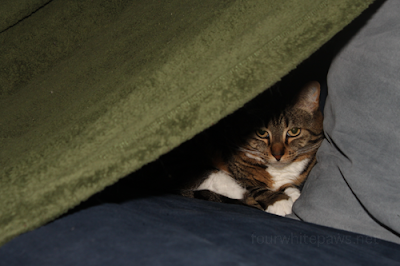 Dude--I so want to come and live at your house...*I* love forts just as much as your kitties! I make one all the time on our sofa. 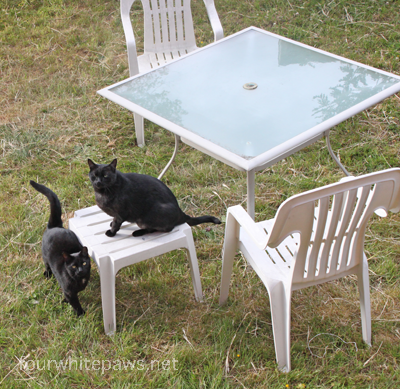 Your kitties DO always have such fun and they sure have a great mom and dad!! I would have to be super careful with that! My luck, I would sit on Cody! lol! That sure is fun and we're big fort fans here too! Sweet! We're fort-dwelling cats from way back and highly recommend them too!